One more circle to close. Before I loved The Bearded Wonder, there was a prophecy. A good man told The Bearded Wonder that he and I would break the spell of broken hearts which plagues both of our family lines. Generations of broken marriages would end with us. I already told you about this. In the beginning of us, there was a dream of our children’s children. We began our love with eternity in our eyes. Maybe that is why we feel most in love when we stand on the beach together, staring out into that infinite slate water where it all started. One day in Maine, I met a family with eternity in their hearts. They have a tiny daughter with a thunderous strength and a broken heart. Her name is Josephine, Josie. The same name of my favorite female literary heroine of all time, Josephine March. They are a family of little women. They are the Hutchins. I have known them for a couple of years now and written about them before. But the full story of why their faith is so strong did not become clear to me till we went to the place where they do life. Maine. First and foremost, I have to tell you all that I am fully obsessed with Maine. It is exactly magical and romantic. Rocky coastlines, four seasons, charming towns, rugged hard-working people. Lobster. The Bearded Wonder and I travelled with our noisy tribe from Massachusetts to Maine in order to gather footage and do interviews of this family for a massive video project we are doing. We are making a film about Pulmonary Vein Stenosis, the disease which Jack and little Josie have and which has taken the lives of entirely too many children. Many of these deaths are unpreventable, but many are. There is too much unsaid about the disease and the assumption that is is always a death sentence has become a self-fulfilling prophecy. Our goal was to go up and artfully capture the story of the Hutchins to add to the other stories we had collected in other interviews with other families affected by Pulmonary Vein Stenosis. I expected it to be a challenging trip full of crying babies and fitful toddler tantrums. It was that but it was also full of surprises. This is where my last circle makes its loop. When the work of the interviews were said and done, it was time to enjoy just being together. Being with a family whose faith is the same as ours, whose family size is just as large as our own, and whose precious one is fighting the same heart disease we have battled is … cathartic. Intensely. They get us. We get them. We all headed out for a day in Maine. On the drive, we passed a cemetery where two of Michael’s (Josie’s dad) twin baby brothers were buried years ago. Their is pain and loss in the soil of this place, I thought, as we passed the head stones. This family is familiar with it. I was surprised to discover that Michael’s family were Maine people for many generations. Like since the Mayflower, literally. We spent the day at an old fort, travelled up to the top of a dizzying tower to look out over the stunning landscape, and saw a bald eagle at the edge of a navy blue river. We packed our sweaty kids back into their carseats and travelled to Michael’s parent’s house. I spent half of the drive drilling the children on how important it is that we keep our hands to ourselves and not break things in Josie’s grandparents house. I was worried. Worried about broken nicknacks and policing my rowdy boys in a new environment. As we pulled into the driveway, The Bearded Wonder and I exchanged significant looks and felt the stress melt away. We had just pulled into boy heaven. To the left was a lovely pine playground and a barn full of ride on toys. I exhaled in relief knowing that I wouldn’t spend the evening stooped at a ninety degree angle trying to keep my toddlers out of things. They were free to roam. That would have been sweet enough. But then I met Michael’s parents. Martha walked up to our car (and no doubt got an eyeful of how gross it is in there). She greeted me with a warm, familiarity that I would have expected from my own kin. Immediately, she told me that when she and her husband found out that when, two years ago, we had travelled three hours to meet the Hutchins at Boston Children’s Hospital, they just cried and cried. She was so thankful for the way we had come so far to bring encouragement (and pizza) to her son and daughter-in-law. The children played outside and ate large bowls of ice cream. I drank in the sight of these grandparents loving on everyone. I have met people who make a lasting impression on me; people who become my eternal reference point as someone whom I strive to become more like. These two grandparents are now my new goal in life. These two people made life decisions based on the generations following them and those who came before. They have eternity in their eyes. She took me into her home. I stepped into a library full of the dreamiest books. Filled with treasured dolls and daguerreotypes, Thornton Burgess and Gene Stratton Porter. These things were from her family. Carefully archived family histories and treasured books lined the shelves of the warmest, most inviting room I may have ever set foot in. I come from a long line of brokenness. To see a man and woman living a life so full and so unbroken changed me. It changed me like I was changed when my dad and little sister and I met The Darringtons. They were the first whole and free family I had ever seen. They became the goal of my life all those years ago. Being in that room with those things all around me didn’t feel like being in a museum of untouchable things. It felt as if everything was meant to be touched and loved because they weren’t the things that mattered but they served as reminders of the people who held and touched them in decades past. They were icons of tribute to the souls who mattered. Books are my love language. Familiar titles and well-worn bindings reach me. When I see a copy of The Harvester by Gene Stratton Porter, I don’t only see a beautiful marigold binding with floral reliefs on the cover, I see the first time I understood what my grandmother longed for when she was a girl, because I was reading one of her favorite childhood books. I live for a beautiful story. And books represent that for me. 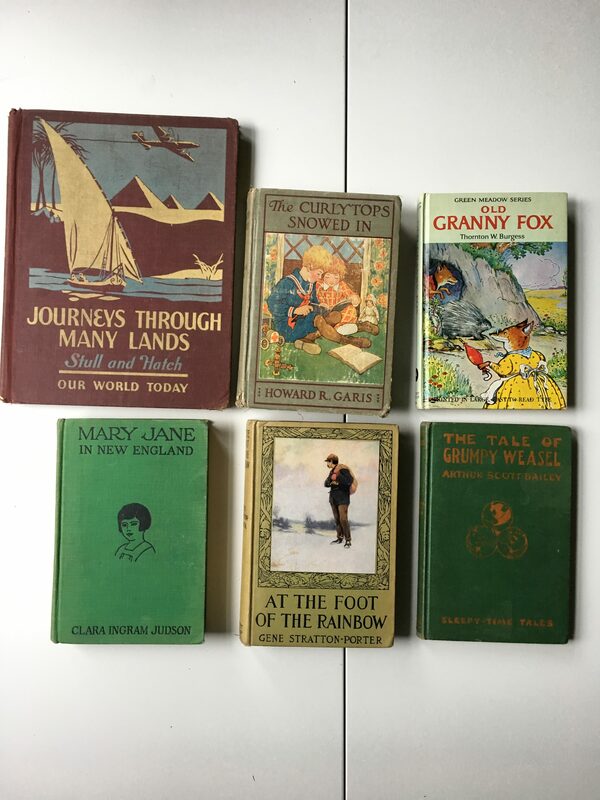 So when Martha handed me some of the most exquisite books, which she had hand selected from her own library of family heirloom books, because they reminded her of me for one reason or another, I was undone. I have been given some treasured gifts in my life and I remember them all. But receiving these precious books from a woman who felt that she knew me just by reading my work … I was so seen. So loved on. Martha, if you are reading this, I cried in the car when I left your home. I have never been given such a beautiful gift. The books. The glimpse into a life of pouring into the next generation. The Bearded Wonder and I still think about your home in Maine and the way you brought us ice cream and the way you gave Jack his very first tractor ride. We strive now to pattern our life to be forward thinking, pouring into our children’s children. We want to see our lives with a veil of eternity always before us, to filter our eyes to see Jesus and how we can show him to our great-great-grandchildren’s great-great-grandchildren. The Journeys though Many Lands book is from Molly. The irony of our adventures through many places and the journey which our separate families have taken with heart disease make this a treasure. I snapped this picture of these beautiful books before packing them away for our journey home to California. Much of our time in Massachusetts were spent in an agony of waiting. Will baby Jack survive? That kind of agony changes a person. It’s like eternal labor pains with no clear idea of what will come of all of it. We knew some dark days. It was because of the intense blackness of those dark days that any ray of light looked like heaven. Meeting Josie that night at Boston was a ray of light. It was not the first time we had come to encourage a family with a heart baby but it was definitely one of the most impactful for us. We made life long friends that night. Ending our time in Massachusetts by finding out more about their family and the faith which has made them strong, was a delicious full circle way to sum up our time with them. Keep your head up when the darkness come, and it will come, because those precious few rays of light are probably directly broadcast from heaven for you. It isn’t the darkness you should fear, its when you finally stop scanning the horizon for light that you should fear. Oh Amy! How wonderful to have the privilege of meeting and spending time with such a wonderful family! And I love the books–so special. Thank You for sharing .